The sealed LED ring light for the VE Series smart camera provides bright, uniform illumination for applications in challenging environmental conditions. It has a rugged build that combines a lens cover and high-intensity LED lights in a single unit that mounts to the camera to achieve an IP67 rating. The light is powered and controlled by the camera, simplifying installation and management. Reliable Performance in Harsh Conditions: The ring light has a rugged, sealed construction and is available in models with a polycarbonate or borosilicate glass window. It mounts directly on the VE Series Smart Camera to create one IP67-rated unit that is protected against moisture, dust, dirt, heat, and other environmental challenges. Easy Installation for Rapid Deployment: Simply attach the sealed ring light onto the threaded portion of the VE Series smart camera and connect the power cable to the light connection at the base of the camera. Together the ring light and the smart camera form a single device that is easy to install and is capable of illuminating surfaces and conducting complex inspections. Simple Setup and Management: Sealed ring lights for the VE Series smart camera offer continuous or strobed operation. Users can setup the ring light directly from the camera using the on-board buttons or remotely using Vision Manager software, providing users with an intuitive user interface to manage both devices. Bright, Uniform Illumination: Featuring six high-intensity LED lights, sealed ring lights for the VE Series provide bright, even illumination over a small area, reduce shadows on images with protrusions, and use color to create contrast in objects. 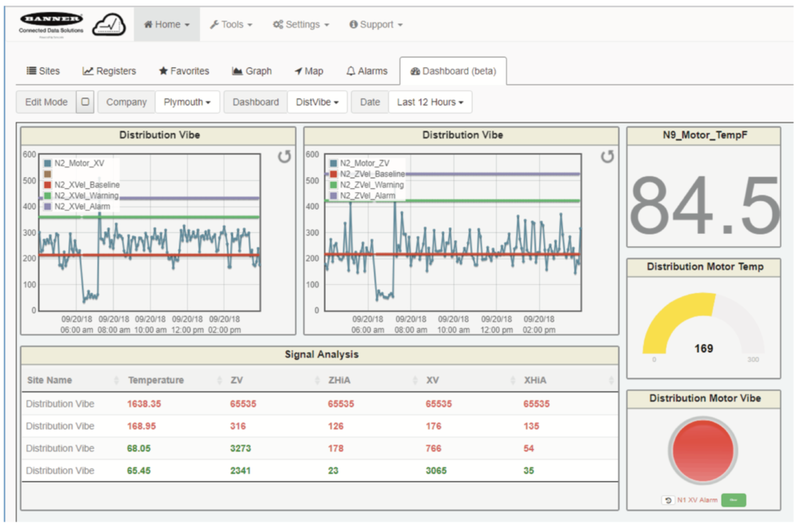 The Connected Data Solutions software is a cloud-based platform that allows users to visualize, create alerts, store, and analyze critical data collected by Banner wired and wireless sensors. The software complements our wireless product portfolio and provides customers with complete end-to-end IIoT solutions. The Connected Data Solutions platform is more than a dashboard. With analytics and visualization tools, the software delivers actionable insights that allow you to solve real challenges on the factory floor. Plus, the ability to store data and analyze trends over time helps you make better, data-driven decisions long-term. The Connected Data Solutions platform allows you to remotely access data anytime and anywhere using an internet-connected Banner gateway. In addition, you can define parameters to control when to receive notifications via email or SMS message. On-demand visibility and real-time alerts allow you to remotely monitor and diagnose systems quickly, saving time and costs. Predictive maintenance is a key capability of Banner's IIoT solutions. The software platform helps you use device data to predict machine maintenance requirements, which reduces unplanned downtime, increases mean time between failures (MTBF),and reduces maintenance costs. Banner Engineering's new K50 Pro touch buttons provide more flexibility with RGB technology and Pro Editor configuration capabilities. The easy-to-use Pro Editor software offers a wide variety of color and animation options, adding versatility to a wide range of applications. Flexibility with Pro Editor: Easily customize touch buttons with a wide variety of color and animation options. In addition, give your machine more flexibility with additional features like adjustable touch sensitivity, which allows users to optimize sensitivity levels to avoid false trips in washdown areas. Reliable Operation in a Wide Variety of Environments: The rugged IP69K design means reliable actuation in a variety of conditions, including harsh environments. The touch buttons operate in wet or dry environments and with gloved or bare hands. Models made with FDA-approved materials are available for use in the food and beverage industries. Increase Production Efficiency: Thanks to a wide range of colors and animations, each change in status or step in a process can be assigned its own unique color or animation. This helps users learn and interpret signals quickly and make fewer errors, saving time and money. Streamline Your Supply Chain: K50 Pro touch buttons can be programmed in the field to meet the needs of any application. Users can standardize on the K50 Pro Series, reducing inventory requirements. The SLC4 is the latest addition to Banner’s line of compact, low-profile safety light curtains, which includes the full feature LP Series and cost-effective LP Basic Series. These safety light curtains are now available in lengths of 160 mm up to 1250 mm, including new 410 mm and 690 mm models of the LP Basic safety light curtain. The T18-2 Series, the next generation of the popular T18 Series, was designed for a higher level of performance in harsh, washdown environments. The new T18-2 photoelectric sensors have an FDA-grade shatterproof plastic housing and are IP69K rated and ECOLAB™ certified to protect against water ingress and chemical washdown. In thermal shock environments, the all-plastic, ultrasonically welded, and epoxy encapsulated housing of the T18-2 outperforms competitive sensors with metal housings. IP69K and Epoxy Encapsulation for Wet Environments: The T18-2 Series sensor is designed to hold up to high-pressure, high-temperature washdown. The epoxy fill eliminates internal air cavities in the housing that can lead to condensation inside sensors during temperature cycling. ECOLAB™ Certified FDA Grade Plastic: The sensors have been tested by Ecolab to certify that they resist damage when exposed to common cleaning chemicals. The plastic used throughout the T18-2 is made of FDA-approved shatterproof plastic for use on food production lines. Improved Design for Easier Cleaning: Crevices have been minimized to eliminate debris buildup. The knurls have also been removed from the nut, and the light pipes have been over-molded for easy cleaning. All labels have been removed and replaced with permanent laser etching. Installing the nut, optional seal kit, and bracket will cover all exposed threads on the nose. Durable Ultrasonic Weld for a Superior Seal: Ultrasonic welding is an advantage of using an all-plastic housing and creates a superior joint. Metal sensors contain plastic windows and other components that are joined mechanically or with adhesives. The joints are then subject to thermal shock because the metal and plastic components expand and contract at different rates, creating small gaps and allowing water inside the sensor. Ultrasonic welding fuses plastic components into one solid piece of durable plastic that is not affected by thermal shock. Banner Engineering adds more models to the EZ-STATUS family of combined illumination and indication products: the WLS28-2 with EZ-STATUS and heavy diffuse models of the WLS27. The WLS28-2 Multicolor LED Strip Lights with EZ-STATUS combines illumination with high-visibility indication in one robust strip light. They are made with the same durable WLS28 housing plus energy-efficient LEDs for challenging applications that require bright, even lighting and proper identification of status changes on machines or in work areas. Available in dual, three, and five color options, the WLS27 Heavy Diffuse Strip Light features many of the same great aspects of the WLS27 product line, such as a rugged and water-resistant construction, but now comes with heavy diffuse copolyester windows for reduced intensity and a more uniform light distribution. The heavy diffuse WLS27 further advances the new trend of lighting products that feature illumination and indication in a single device. Efficient Machine Operation and Troubleshooting: Proper illumination allows for easier process monitoring and task performance. An easy-to-see change in color can direct operators to the section of the machine that needs attention for quick identification and resolution of problems. Better Productivity and Quality: The new WLS28-2 and WLS27 both give staff the ability to focus on tasks without diverting their attention to machine status. The vivid and uniform light helps workers complete tasks quickly and correctly. The light changes colors as statuses change for an unmistakable alert within natural sight lines. Softened Light Intensity for Indication: The WLS27 with heavy diffuse window offers a more uniform light distribution that is more comfortable on the eyes and has fewer hotspots. Mute arm kits for LS safety light curtains are now available. These kits are designed to make it easy to add muting capabilities to any safeguarding application requiring arm, hand, or finger detection. To create a complete solution, users can combine the mute arm kits with LS Series safety light curtains, SC26 or XS26 safety controllers, Banner indicator lights, and plug-and-play cables. Together, these products create an intuitive safety system that is easy to deploy and manage. Easy Installation: Mute arm kits eliminate the hassle and complication of installing multiple muting sensors individually. They include pre-mounted hardware, Q20 retroreflective sensors, reflectors, and plug-and-play mechanical and electrical connections. Quick Configuration: The intuitive programming environment, graphical user interface, and drag-and-drop operation provided by SC26 and XS26 Series safety controllers make it easy to configure mute functions and manage safety systems. Simplify Inventory: These mute arm kits can be used with LS Series safety light curtains (additional hardware kit required) and SGS Series safety grid systems with integral muting. Versatility: Muting arm kits adjust easily to accommodate line changes. iVu Series Vision Sensors are now available in models capable of color inspections. iVu Color Sensors build on the inspection capabilities offered by iVu Vision Sensors by enabling inspections based on color or variations in color, as well as by type, size, orientation, or position. They offer the same ease-of-use, features, and compact design as other iVu Vision Sensors, and are available in models with an integrated or remote touch screen. Sensor types can be used alone or together to solve more applications and more complex applications. Increased Uptime: iVu Series Vision Sensors can store up to 30 inspections. Inspection parameters can be changed while inspections are in progress without stopping and restarting processes. Ease of Use: iVu Color Sensors feature touch screen operation, have a graphical user interface, and menu-driven tools that make it easy to setup, manage, and monitor inspections without a PC. New Tower Lights Offer Tremendous Potential for Custom Indication. TL50 Pro Tower Lights with IO-Link provide users with an almost limitless capacity for standard and custom indication. These versatile tower lights combine the vast color options provided by RGB LEDs with the dynamic control capabilities offered by the IO-Link communication protocol. 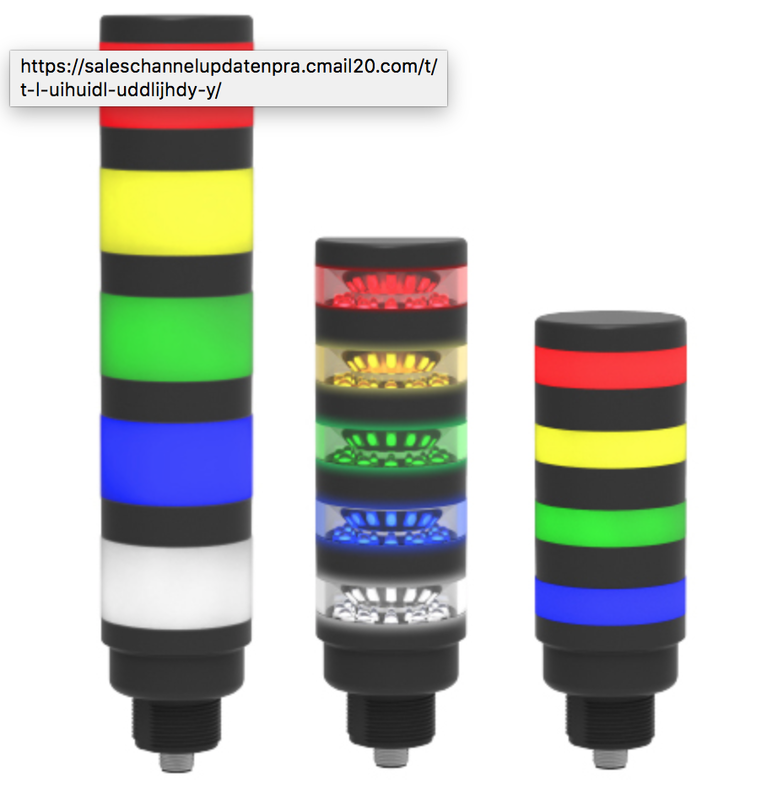 They are available in standard, beacon, and compact models and support up to 10 light segments with the option to add an audible segment, for a total of 11 segments possible with each tower light. Customized Indication: IO-Link enables full control of color, flash, rotation, and light intensity. Users can access millions of colors and create unique animations that attract attention and effectively communicate status. Versatile Display: TL50 Pro Tower Lights can be used for standard indication applications where each segment displays a unique status. They can also be used as an advanced indicator for a dynamic condition, such as fill level or temperature monitoring. Simplified Wiring: Tower lights are connected using standard unshielded 4-wire cables, which reduces the time and expense required for installation and simplifies inventory requirements. Drop-in Installation: An IO-Link master device saves configuration data and automatically updates new indicators, enabling quick, easy replacement of indicator lights.